My husband is Jewish. When I married him, I was blessed with marrying into his family’s traditions, as well. I love the Jewish holidays. Hanukkah (sometimes spelled Chanukah) is the Festival of Lights and a time of joyous celebration. Hanukkah is NOT “Jewish Christmas.” In fact, Hanukkah precedes Christ’s birth by 165 years! Hanukkah is celebrated on the 25th of Kislev on the Hebrew calendar, which puts it sometime in December but the date on our calendar varies from year to year. The holiday is an 8-day commemoration of a miracle. The miracle of the oil. You see, Israel was overrun by the Syrians. While under siege, they were forbidden to worship God. In fact, their temple was desecrated by the evil Syrian king, Antiochus. So, the heroic Judah Macabee and his sons lead a 3 year fight to regain control of their land and the temple. When they won, there was only 2 days worth of holy oil left to burn the lights in the temple. But the Lord honored their faith. God miraculously caused that oil to burn bright for 8 days until more holy oil could be found. Thus, the Festival of Lights! On Hanukkah, our family enjoys a delicious dairy meal that includes tuna salad, egg salad, bagels, macaroni and cheese and potato latkes! 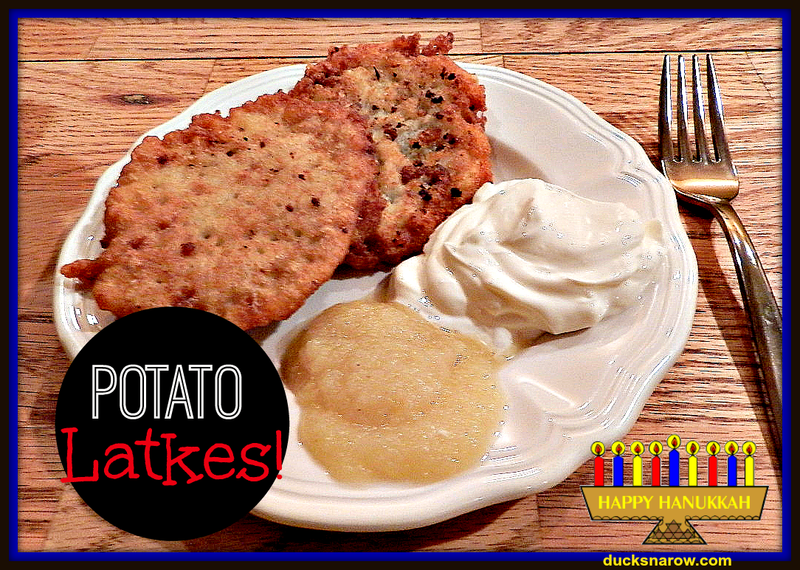 Potato latkes are potato pancakes that are fried in hot oil and served with applesauce and sour cream to dip them in. They are easy to make but plan on making a lot of them. We went through 4 platters of latkes in one seating for 10 adults and 4 little children. I used 8 pounds of potatoes and we only had a few leftovers that my future daughter-in-law, Shauna, gladly took home for herself. She says she thinks she should have been born Jewish…she LOVES the food! Well, I am also proof that you don’t have to be Jewish to make them or love them. In fact, I hid three leftover latkes for myself and that was today’s lunch! Here is our family recipe and some tips to make it right even on your first try! If you will be serving this for a party, you will want to peel them in advance. Store the peeled potatoes in cold water in the refrigerator to keep them from turning color. 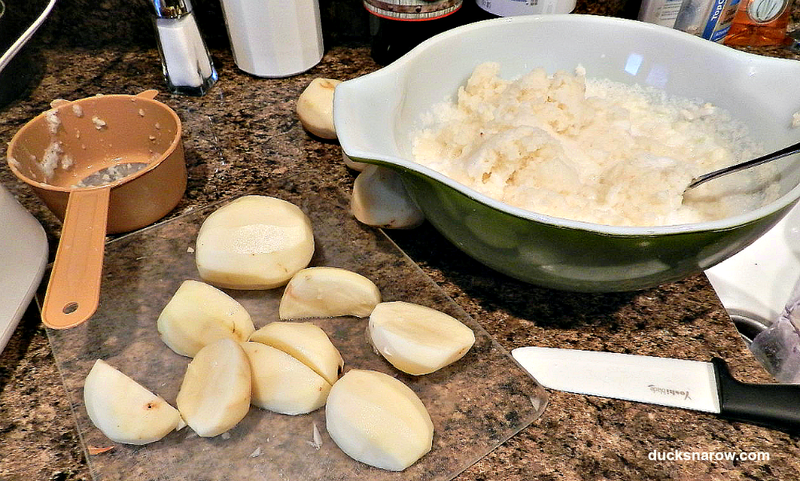 Cut the potatoes in large pieces and put them in a blender filled with cold water. Grate the potatoes till fine. Strain the water and press the potato to get the excess water out. Put the grated potato in a very large mixing bowl. Grate the onion in the same container, till fine. Add eggs, salt, pepper and flour and mix well with a large spoon. Heat the oil in a big skillet (or two) on high. DO NOT LEAVE THE STOVE. Hot oil is a fire hazard! Gently spoon large “blops” of the batter into the hot oil. Fry until one side is brown. gently flip the latkes onto the other side. As each side is golden brown and crisp, move them onto a paper-towel lined platter. After the oil drains off a bit, either put them on a cookie sheet in the oven on 200ºF to keep them warm or move them to a serving platter and serve immediately. 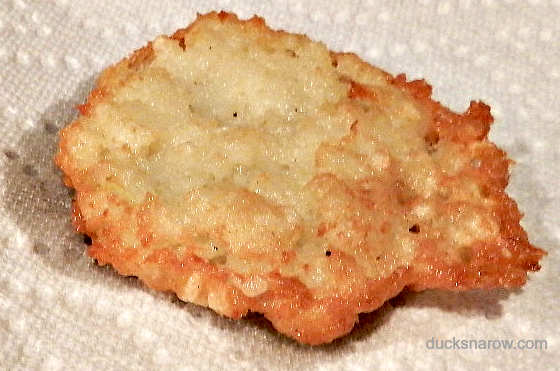 This is what a fried latke should look like. TIP 1: to give it some “plump”, when you first spoon batter into the oil, spoon one more bit of batter ontop of it. That will give your latke some volume, otherwise it will be very flat and crisp. TIP 2: the amount of flour you will need depends on how well you drain the grated potatoes. You may find that you want to add a little more flour if your batter is spreading thin. TIP 3: do NOT immerse the batter in oil. This is not deep-frying. 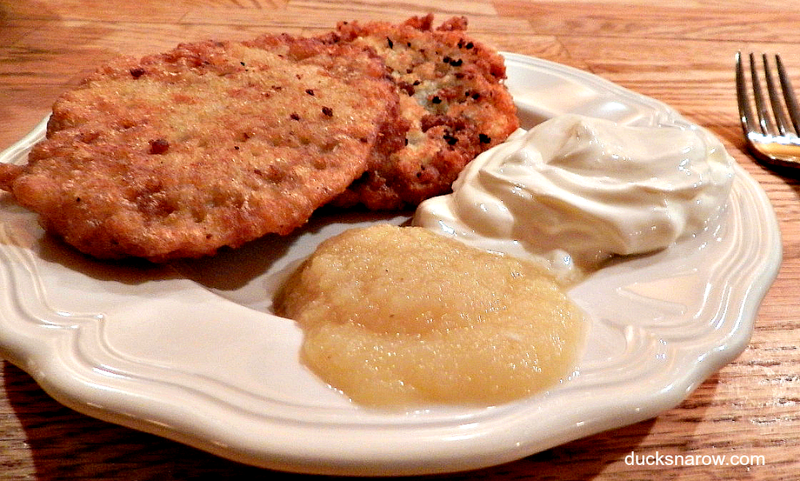 The oil should come up about halfway on each uncooked latke. Immersing them will result in a much oilier product. What dishes do you serve?